While the forecast in McCormick Place at RSNA 2010 might be described as “partly cloudy,” the exhibit hall at this past November’s annual meeting could be termed “cloud covered.” With image-sharing solutions,, storage options, EHRs and other systems, everyone seemed to be touting something cloud based—even though Web-based platforms are nothing new to healthcare. Saint-Clair says the adoption of cloud computing technologies among healthcare providers has accelerated since 2010. “Low cost of acquisition, increased confidence in high security and HIPAA compliance standards, ease of implementation, and cost-effective operating models are key elements that are influencing decision makers,” he says. Just what’s out there in the way of real cloud options and who in radiology is implementing these solutions? 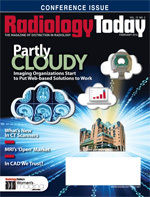 Radiology Today spoke with a few facilities that have implemented cloud-based solutions to see what drove them to their respective choices and how they’ve fared thus far. Northern Westchester Hospital, a 163-bed general medical and surgical hospital in Mount Kisco, New York, is one hospital that has been utilizing cloud storage services since it went digital about eight years ago, according to David Natoli, administrative director of imaging and cardiology services. Natoli says the hospital implemented CoActiv’s EXAM-VAULT QUAD-REDUNDANT ARCHIVING for primary storage, disaster recovery, and business continuity. “We also utilize EXAM-PACS running from the cloud to provide users outside the radiology department with fast, secure, and easy access to our images,” he says. Natoli explains that CoActiv stores its images in four separate locations for better security while also providing image backup, archiving, and business continuity along with archiving. “This has given us significant cost savings when compared to in-house archiving by eliminating archive hardware, software, and maintenance costs,” he says. Cost was a big part of Northern Westchester’s decision to try out the cloud, as was keeping its referring physicians happy. “With the CoActiv cloud-based archive service, we know exactly what our full archiving expenses will be year in and year out,” says Natoli. “By contrast, in-house archiving might require an unplanned capital equipment purchase of hardware if exam volumes exceed the predicted amount. Additionally, their cloud archiving eliminates the expenses of archiving maintenance and upgrades. “Because images are stored in a vendor-neutral archive format, they can be easily communicated anywhere—for referrers, physician collaboration, second opinions, and even remote third-party post processing systems,” he adds. Second, facilities considering cloud options might be concerned about the possibilities of downtime when dealing with Web-based solutions; that hasn’t been an issue for Northern Westchester. Natoli says there hasn’t been a single minute of downtime in eight years with CoActiv. The hospital is happy with its cloud experience, and the imaging department is awaiting CoActiv’s newest cloud option, the EXAM-BROWSER zero-footprint universal DICOM viewer, which enables anywhere, anytime review of medical images via a Web browser. The cloud also offers a secure way to transfer images via the Internet between multiple facilities, connecting directly to a hospital's PACS system. “This helps hospitals avoid implementing [virtual private networks] to connect facilities and also eliminates physical media transfer, such as by CD or films, [which is traditionally] slow and prone to errors,” says Marc Mackey, general manager of Voyant Health. Facilities routinely deal with large numbers of CDs with patient images. Managing these discs and images is time consuming. Lost, forgotten, or unreadable CDs can delay the treatment process. Cloud-based image sharing service allows hospitals to electronically receive images directly, which helps expedite urgent cases and eliminates the high costs of duplicate imaging, according to Mackey. Jacksonville Orthopaedic Institute (JOI), which encompasses six facilities and 31 physicians in the Jacksonville, Florida, area, entered the cloud arena more than one year ago hoping to benefit from these image exchange benefits. Utilizing VoyantLink to receive patient images from multiple area imaging centers and urgent care clinics, the institute is also expanding its use of VoyantLink to provide physicians with access to online data enrichment applications and image viewing. “We are using Voyant Health’s product called VoyantLink to download studies performed at numerous area independent imaging centers directly into our PACS system,” says Debbie Wright, JOI’s IT director. Beyond allowing users to access images, VoyantLink also allows users to employ clinical planning tools and push completed plans to any device or storage location, allowing for live collaboration, data enrichment, and planning applications, all aimed at allowing more effective clinical decision making. Wright explains that several factors led the practice to the conclusion that there had to be a better way to make outside studies available, both at the time of a patient’s appointment and in preconsultative capacity for physician review. JOI’s physicians also expressed interest in being able to view images within their own PACS to avoid manipulating through unfamiliar and time-consuming viewers. Now with VoyantLink, studies are made available to all physicians inside their PACS utilizing their own viewer, most times prior to the appointment, with little to no intervention on the part of JOI’s medical assistant, according to Wright. Noting that the newness of the technology has been challenging, as it took some time for JOI to tailor the product to its unique needs and workflow, Wright says the use of this cloud-based solution has undoubtedly improved workflow at the practice and allowed for improved efficiencies while enhancing patient services. “Practices should be aware that dedicated effort is required, and essential elements of success are the willingness to devote time for coordination and commitment to communication between parties,” she advises facilities considering a similar cloud solution. Santa Barbara Cottage Hospital (SBCH), a 408-bed acute care teaching hospital in California, has experience with another image sharing service, eMix. Quick to sign up for the service two years ago, the health system decided to defer implementation until a zero-download application (ZDA) version of the service became available, which happened recently. “This ZDA version on the receiving end works through any browser, without any client to download and install whatsoever. So we plan to start using eMix going forward in a production fashion,” explains Michael A. Trambert, MD, who along with radiology resident Mark Kovacs, MD, presented a scientific session at RSNA 2011 on the obstacles that can present when exchanging patient data, noting that the cloud can address many of these with its low-cost, secure, near-instantaneous, and vendor-neutral characteristics. With his limited use to date, in addition to his research project assessing eMix usage at other sites that have been utilizing the service, Trambert sees near-immediate access to images and reports as a key benefit of the system. That access facilitates better patient care, “especially for patients being transferred with images often arriving before the patients, helping caregivers plan treatment and resources before the patient arrives. This is especially critical for trauma patients,” Trambert says. More recently, Trambert says the health system has also signed up for—and is looking forward to—participating in a beta capacity for DR Systems’ cloud-based EHR, which is seeking federal meaningful use certification. “This cloud-based EHR, fully integrated into the PACS, will present the meaningful use information in one screen, accessed via the patient’s exam electronic requisition via a click,” says Trambert. “We’re also looking forward to leveraging the additional module of EMRConnect, where you can take HL7 [Health Level Seven International] feeds and automatically direct them to a dropbox on a referring physician’s office computer so that their local EMR can harvest those reports and put them directly into the referring physician’s office-based EMR,” he adds. Though it’s relatively easy to demonstrate cost savings by adopting cloud technologies, Mackey says the key to improving patient outcomes using the cloud lies in bringing clinical planning and collaboration tools online. The ability to benefit from expert knowledge and outcomes data, he says, is where cloud technologies’ greatest potential may lie. “Aggregating diagnostic patient data, treatment plans, and allowing physicians and researchers across the country, or even the globe, to collaborate on this data is a huge opportunity to advance the state of medical knowledge,” Mackey says. “For example, an online DICOM viewer used to view images could include additional tools that would help a physician outline a tumor and surrounding organs at risk and then plan a treatment. This information could then be shared instantly with another physician at another facility to receive a second opinion or further guidance. Software may even evolve to instantly display then-current national statistical results of outcomes data based on the planned treatment,” he adds.